EA Advanced Accordion is a great way to display multiple strings of text in a stylish manner. It helps in three ways. First, Advanced Accordion helps in cases where there is very little content space. Second, you should use Advanced Accordion to display texts meant for Assistance or Clarification. And lastly, Advanced Accordion helps to add visual appeal to your content. To use this Essential Addons element, find the ‘EA Advanced Accordion‘ element from the Search option under the ‘ELEMENTS‘ tab. 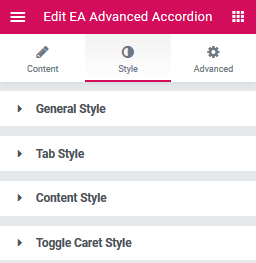 Simply just Drag & Drop the ‘EA Advanced Accordion‘ into the ‘Drag widget here‘ or the ‘+’ section. From the ‘General Settings’ section, you can use the drop-down menu to choose Accordion Type out of these two: Accordion & Toggle. You can enable or disable and change the Toggle Icon & Speed. From the ‘Content Settings’ section, you can change your ‘Content Title’ and ‘Content Type’. By default, ‘Content Type’ is set as ‘Content’. You can add your text or shortcode in the ‘Tab Content’. You can also use your ‘Saved Template’ as ‘Content Type’. You can also change the Tab Icon and enable/disable ‘Active as Default’ tab option. 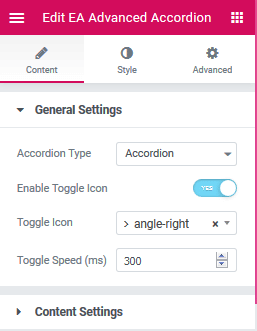 Switch to the ‘Style’ tab to style all the elements of Advanced Accordion. You can add Styling to ‘Tab’, ‘Content’, ‘Icon’, ‘Typography’, ‘Toggle Caret’, ‘Button’ and many more from this section as per your preference. By following these mentioned steps and a bit more modifying & styling, you can easily design your Advanced Accordion as per your preference. This is how you can easily showcase your important contents & make them appealing to your visitors using EA Advanced Accordion. Getting stuck? Feel free to Contact Our Support for any assistance.